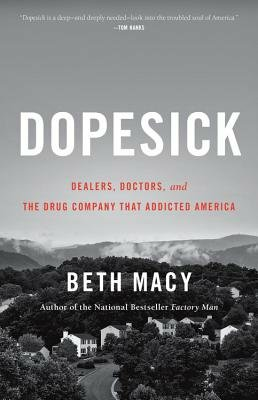 In "Dopesick," newspaper reporter Beth Macy focused her investigative skills and journalistic compassion to the devastating opioid epidemic. She tells a real-life horror story.... Only 10 percent of opioid addicts manage to get treatment. Even when they do, remission is elusive. The book has heroes, too: a country doctor, a nun-turned-drug-counselor, and researchers who pushed the alarm over and over. [U]ntil I read Dopesick by journalist Beth Macy, I didn't grasp all of the factors that have produced the present crisis.... This exhaustively reported book includes many heartbreaking examples of young lives lost to drugs, sometimes so suddenly that parents had been unaware of the problem, sometimes after repeated efforts to help a child get clean in rehabilitation facilities or treatment programs. Although Macy's stories are set in Virginia, they could happen anywhere in the United States. Every number is a tragedy, another drop in the river of heartbreak that's washing over our country and changed the way we live.... Dopesick grew out of reporting Macy did at The Roanoke Times and has an Appalachian focus that grounds its first section, on how Purdue Pharma, the maker of OxyContin, aggressively marketed the drug to rural communities in the region and minimized the risks of addiction. Ms. Macy devotes a large segment of her book to the role of pharmaceutical companies  especially Purdue Pharma, the maker of OxyContinin aggressively marketing addictive medications and of doctors liberally, even carelessly, prescribing them.... Readers familiar with components of the opioid crisis will see that Dopesick covers well-tilled ground, but for those new to the topic there is much to learn. Like many journalists, Ms. Macy writes about the tenacity of addiction as if it were a purely physiological process. ...a harrowing, deeply compassionate dispatch from the heart of a national emergency. The third book by Beth Macy  the author, previously, of Factory Man and Truevine  is a masterwork of narrative journalism, interlacing stories of communities in crisis with dark histories of corporate greed and regulatory indifference.... Macy introduces so many remarkable people that, midway through Dopesick, readers may find it challenging to keep track of them.... Taken as a whole, however, this gripping book is a feat of reporting, research and synthesis. Macy's strengths as a reporter are on full display when she talks to people, gaining the trust of chastened users, grieving families, exhausted medical workers and even a convicted heroin dealer, whose scheduled two-hour interview with the author ended up stretching to more than six hours.... There's a great deal in "Dopesick" that's incredibly bleak, but the most chilling moment for me was a quote from one of Macy's journalist friends. Synthetic opioids had allowed this woman, despite a severe curvature of her spine, to lead an active life without risky surgery. She resented new rules that made it more onerous for her to get the pills. "My life," she told Macy, "is not less important than that of an addict."